In the summer, fiber always takes a backseat. Not sure if it’s due to heat or just needing a break from it, but I tend to neglect the wheel and avoid dyeing (can’t imagine why). But the main reason is that I just get busy with other things. For instance, every summer we head off to Pennsic War, which is two weeks long. But getting ready for it takes much longer than that. This year I decided to deal with some of our rather outrageous stash of fabric. It’s hard not to buy-buy-buy when you have the opportunity. 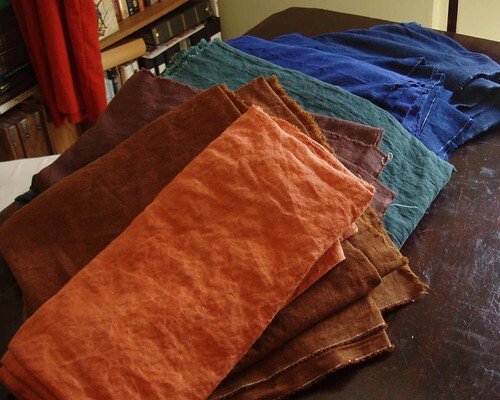 100% linen at $3/yard?? 10 yards please! Each year at Pennsic I go to a particularly awesome fabric merchant (http://www.carolinacalicoes.com/) to stock up, neglecting to review my stash. It’s too easy to get distracted by the beautiful colors and fantastic prices. And when I buy for Rich, I know he has certain colors he likes, so that’s what I buy. Thus we have three shades of blue, two shades of brown, and pieces that we have forgotten their original purpose. Before we go this year, I am steeling myself against buying more, but no guarantees! If Olive well let me, I’m going to work on organizing the wool room today. As soon as I sat down to check the interweb, she got on my lap. You see, it’s cold again, so she’s looking for snuggles and warmth. And since I am a slave to her every whim, I can’t bring myself to displace her. At least I got a good start on the sorting yesterday though. There was a large amount of non-fiber stuff stashed away in the room, and I was using it as an excuse not to deal with my own messes. But now the other stuff is gone. I have no excuses – that mess is all mine. I brought in a few more sets of shelves, but there is still so much more to store and not many more places to put it! I know what I need to do. DE-STASH. But it’s all sorts of odds and ends, little bits of this and that. Ugly fiber. Ugly colors. Batts perhaps? Just toss it all in and see what happens? Maybe I’ll finally just stop over-thinking things and go for it. I’ll put that on the list for later this week. Today is for organizing! The other weekend I traveled down to Pittsburgh to do a bit of dyeing with some friends. Since I used up all my new roving, I went scrounging around to find something to dye (which really wasn’t too difficult since I’ve got bags and bags of fluff waiting in the wings). 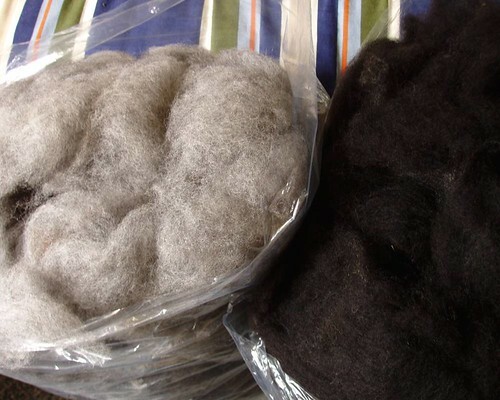 I ended up grabbing a bag of that mysterious wool from Indiana. I cannot remember what breed it is – possibly Dorset? It’s got a rather short staple length, but it isn’t unpleasant and coarse (and not as bad to spin as I first thought). However, I’m hesitant to sell it as roving since I don’t know what it is and it has a bit of VM here and there. But it’s just been sitting there taking up space in my wool room for ages. So I decided to dye it all and save it for myself (besides, there wasn’t that much left). I know I’ll end up knitting all the yarn into mittens, so I’m not being entirely selfish. And I need yarn for knitting anyway. It’s been so long since I’ve dyed for my own use. Usually I spin whatever fiber has been sitting in the shop for the longest amount of time, or the colors that seem too drab. But knowing that everything coming out of those pots would be going to my stash felt great! I think I may have to do this more often. A few days ago I decided I was tired of tripping over bags of recyclables, so I took them out to my car. 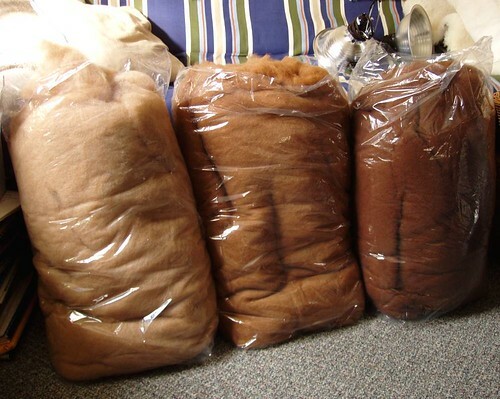 When I opened the trunk, I was somewhat surprised to find several bags of alpaca fleece. I had gotten them the weekend of the demo at the farm and just hadn’t brought them in the house. I relocated them to the kitchen so I could fill the trunk with recyclables. The alpaca fleeces (along with the newly acquired wool fleeces from Rhinebeck) are still sitting in a heap on the kitchen floor. 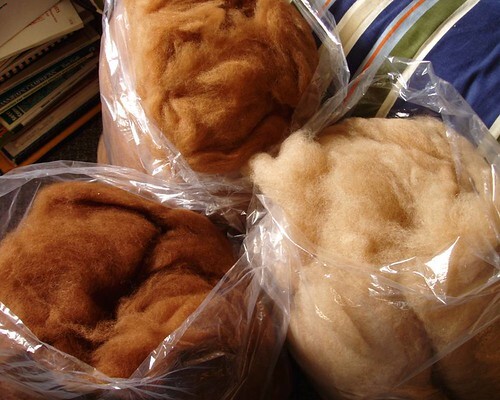 Eventually I will need to relocate them again to the wool room (with all the rest of the fiber), which desperately needs a better storage system. Someday I’m going to cover the back wall in shelves. My totes will go along the bottom, sitting on the floor. I’ll be able to store the bags on the shelves and nothing will have to be stacked. Someday. Question: What is your house full of? Unspun fiber? Handspun yarn? Commercial yarn? Unfinished projects? Finished projects? Where do you stash your stash? How do you store your items? For now the wool room will be known as the multi-purpose room, as it has been used for many things in just 1.5 months. First we stuffed all the furniture into it, then boxes on top; later we cleared out some boxes to release the furniture, but the boxes returned. 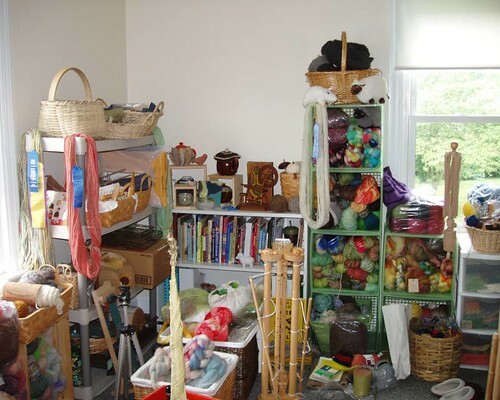 Last week I, with assistance, pulled out all the boxes, rearranged the furniture that was to stay, and began organizing my fiber arts equipment and stash. 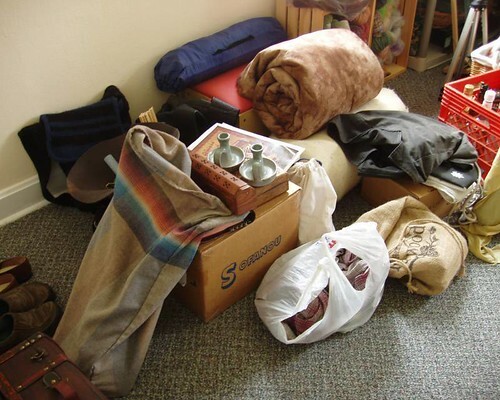 This week one corner of the room has become a gathering area for Pennsic-going items. I have a feeling this room will continue to have an ever-changing identity as we make ourselves at home here. An attempt to organize the wool room. Tools, books, fiber. Our Pennsic gear waiting to be sorted and packed.